What a great CD (though I think overall they’re kind of a mediocre band). 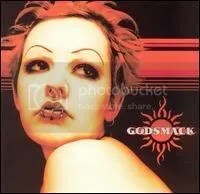 I’m not a big fan of nu/alternative metal, but Godsmack had all the right influences (Priest, Alice in Chains, Metallica) and put it together in a nice lil’ catchy package on their debut (which was originally released as an indie album before Universal signed’em and re-released it with a few song list changes). My first exposure to this while on Christmas vacation visiting a friend and he pulled out this CD during one of our marathon video game sessions. I loved it and bought it myself when I got back home to Florida. A good album to just scream and let some aggression and frustration out. And the album really broke barriers (at least in my house) because even my dad liked “Voodoo”. “Bad Religion” is probably my favorite song though– “GET BAACK!! !” That’s just awesome. A hidden instrumental track is at end of “Voodoo” called “Witch Hunt”.